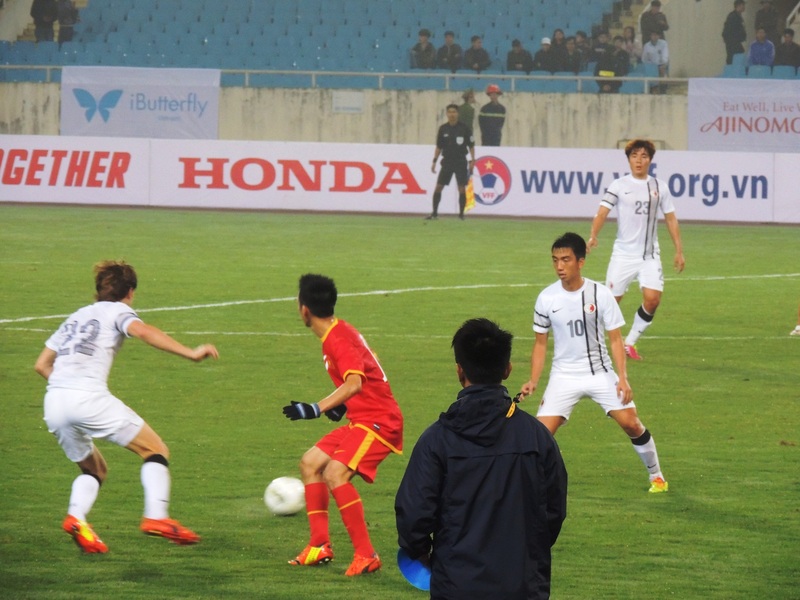 The final AFC Asian Cup round of qualifiers took place last week with Vietnam hosting Hong Kong at the My Dinh Stadium in Hanoi. 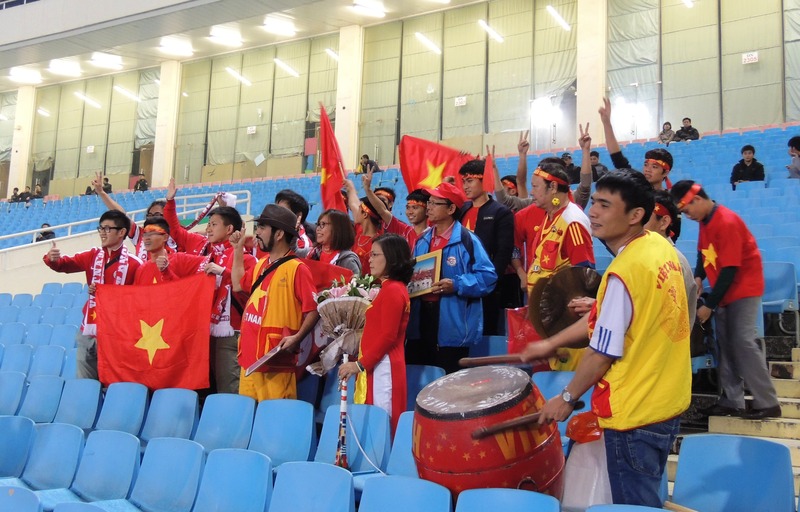 The Vietnamese have endured a dismal campaign, losing all five of their previous matches in a group containing the UAE, Uzbekistan and Hong Kong. Although the game had been moved to a 9pm kick off, to fall in line with the other ties, I was strangely excited to be attending, even under the assumption that not many home fans would be in attendance. 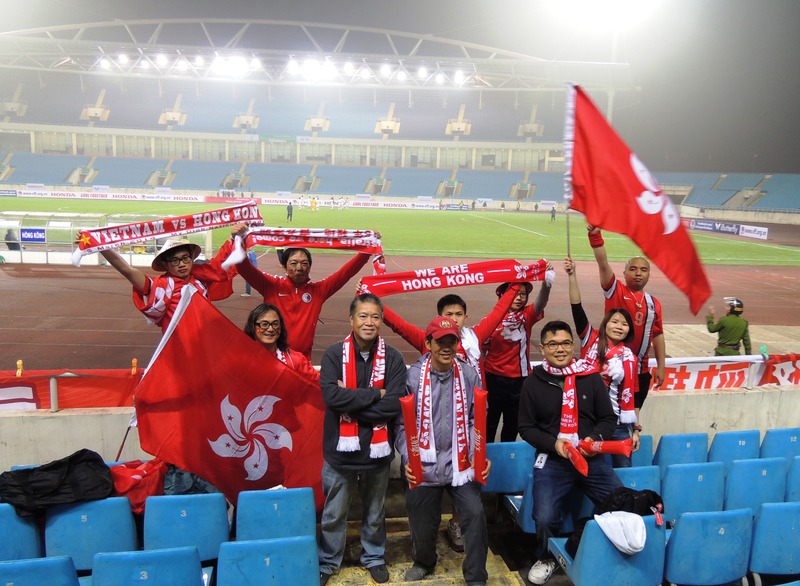 Earlier in the week I’d been contacted by ‘The Power of Hong Kong’, a fan group dedicated to the national team and arranged to meet two of their fans. It turns out 8 fans in total would be coming from Hong Kong, to support their team in the slight hope that still existed for them winning a place on the plane to Australia. Bemused as to why an English guy follows Ha Noi T&T, they had to meet me and discuss. Edmund & Tom, fans of Kitchee FC & Pegasus respectively, are real fans with a passion for their local teams. We discussed the joys of attending a match over sitting at home or in a café to watch Crystal Palace take on Southampton in the EPL at midnight. I’d been promised a ticket to join the HK fans for the match, which included the parents of striker Jaimes McKee. Waiting for the mini bus to arrive outside the stadium, I was approached by a Xe-om driver, asking if I needed a ride. Nothing unusual there. As he pulled away it seems a light bulb went off in his head; the idea of the century had come to him! 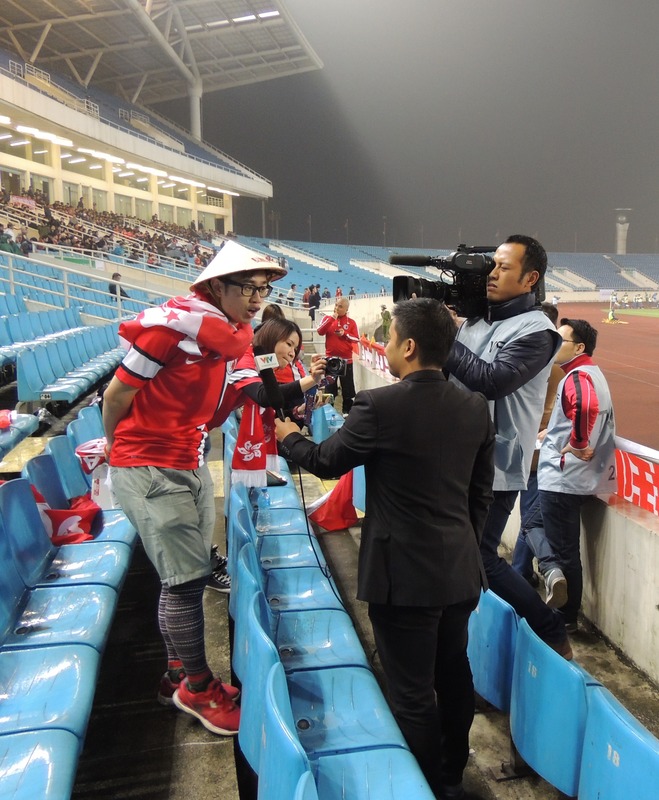 This foreigner, at 8pm, standing in the misty, drizzly surroundings of the My Dinh stadium really needed to buy a pair of fake Channel women’s sunglasses! I couldn’t stop laughing as I declined his enthusiastic offer. I reckon I’d have got a great deal though. The 8 fans had turned to 10 as the drum was put in place and 5 huge flags were attached to the front of the stand; these guys were organized. The songs began, and never stopped. A mix of Cantonese and English, some that I recognized from the stands back home. There was even a few brilliant renditions of “What the F-ing Hell Was That” each time a Vietnamese players shot off target, and “The Referee’s a W@anker”. On more than one occasion, I felt I was back in England. I was loving every minute of it. A win for Hong Kong combined with three other sides losing and they would have been on their way to Australia. Unfortunately, it wasn’t to be for them. On a side note, South East Asia will not have a single representative at next year’s championship. Vietnam looked solid throughout, dominating the midfield and attacking well down each flank. Da Nang’s Quoc Anh opened the scoring following up a Van Quyet effort on 24 minutes. The hosts then dominated possession until half time. Hong Kong came out brightly in the second half, but it was Vietnam who extended their lead through Anh Duc with 20 minutes remaining. Lo Kwan Yee pulled a goal back for Hong Kong, sending the dedicated few wild. 1-2. There was still hope as 9 minutes remained. The hope was dashed just two minutes later as Binh Duong’s Trong Hoang sealed the victory for Vietnam. Full time 3-1. For me though the evening will always be remembered for the amazing few, ‘the power of Hong Kong’; the dedication these fans showed, not just in the physical distance they’d traveled, but through their spirit and belief. It was unbelievable. Their passion, support and organization created an atmosphere worthy of any terrace.